Our members include folks from all walks of life, brought together by our love of birds. Our membership includes students and retirees, pet owners and professionals. 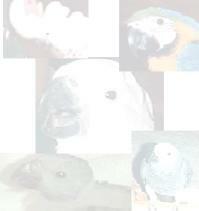 Some of us have owned and raised parrots for a lifetime, but most of us are relative newcomers. Our meetings provide a great environment to both learn and share. Anyone with an interest in exotic birds is welcome. We meet regularly at 6 p.m. on the 2nd Sunday of each month at the Gardenwood Park Civic League building, 5652 Haden Road, Virginia Beach. Meetings generally include a guest speaker or workshop topic, a raffle table , business meeting, and of course, refreshments and time to socialize. When we're not meeting, taking care of our birds, or talking on the phone, we are sponsoring Bird Marts, speakers, sexing clinics, and community outreach programs. Our monthly newsletter, The Hatchling, is full of club news, legislative bulletins, bird care tips, as well as bird and supply classified ads . We participate in the annual Bird Clubs of Virginia convention, and are active with both AFA and BCA. We sponsor annual money making projects, including a major bird raffle at the BCV convention, to raise funds to help support the many worthy avian research programs throughout the United States and Central America. If there is a better, tamer, healthier parrot in your future, it's because together we helped produce it.